ATTENTION: The expanded, second edition of A Head's Up On Koca Nola is now available via mail order! Author Charles David Head will also have copies available for purchase at several Southern antique bottle shows during 2016. 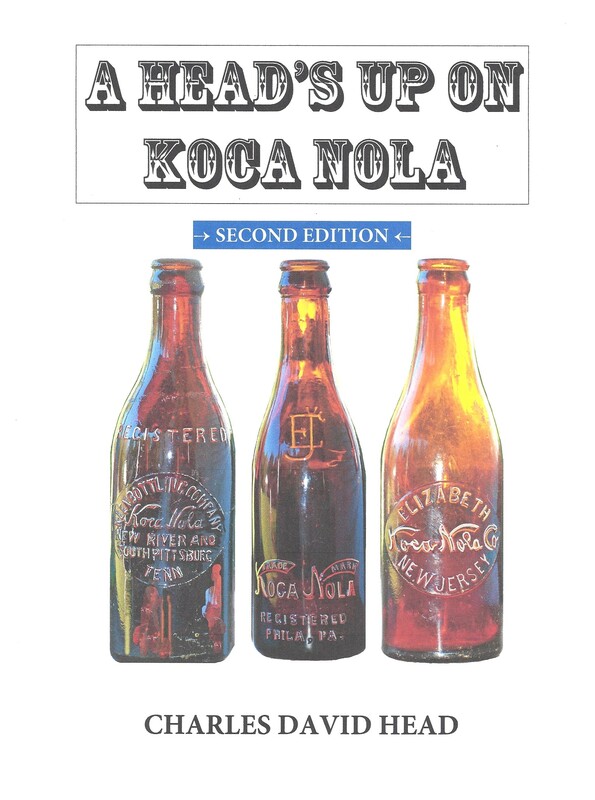 SECOND EDITION OF KOCA NOLA BOOK AVAILABLE! LIKE THE FIRST EDITION, COPIES WILL SELL QUICKLY, SO ORDER NOW BEFORE THEY ARE ALL GONE! KocaNola.com is a site dedicated to the process of gathering, preserving, and sharing historical information about Koca Nola. Much of the information and material accumulated thus far has been obtained thanks to the strong and much-appreciated support of a core group of advanced collectors and researchers who have generously responded to advertisements placed in hobby publications. By broadening communication about this initiative to the world wide web, we are expanding our search and reaching out to all collectors and historians across the continent. Our objective is to support and promote the preservation, study, documentation, collection, display, communication and sharing of information about everything related to Koca Nola. We are continuing to gather information for the next edition of A Heads-Up On Koca Nola, the book (with price-value guide) I have authored about Koca Nola. Longer term we will continue to gather and present information, and utilize KocaNola.com as a centralized repository and source of information for anyone interested in Koca Nola. Confirmed as having 75 franchises in 24 states, DC, Mexico, and Cuba (and counting), the Koca Nola Company was probably one of the most successful of all the early copycat soda brands. It is this author's conjecture that during the company's 1906-1909 heyday, Koca Nola was one of the top five selling soda brands in the United States. Do not wait for someone else to submit information. If you have any Koca Nola-related information, please contact us as soon as possible. Your help is needed!